2019 CSA Veggie Shares Available! CSA Stands for Community Supported Agriculture. It is an alternative to the conventional food system, designed to support local farms and farmers, and connect communities to their food. When you become a member of our CSA, you pay for a share of our farm’s harvest ahead of the growing season, agreeing to share in the abundant rewards and inherent risks of sustainable farming. This provides us with the funds to buy the seeds and supplies that we need to grow your veggies and allows us to focus on growing high quality produce while enhancing the land that we are farming, instead of marketing. You get a share of the harvest each week, taking home a variety of super fresh, often picked that day, organically grown produce that has been selected by us for flavor and nutrition. Your membership supports a community based, environmentally regenerative food-system, free of long distance trucking, packaging, and chemical inputs. You are invited to come enjoy nature on the farm. Take a walk, enjoy our pick-your-own crops, take a moment to enjoy the birds, bugs, sites and smells. We will see you each week at pick-up and look forward to getting to know you and give you weekly farm updates! 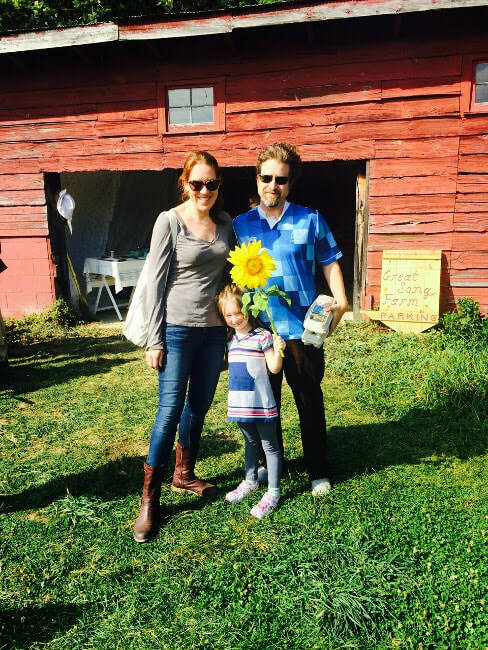 By becoming a member of our CSA, you truly become a part of this farm. We look forward to growing with you and are excited for 2019! We offer a Free Choice CSA model, in which members choose what they take home each week using a simple point system. Each member has 10 points per week to use. Harvest items will be assigned an amount of points based on availability, and you get to choose which items you want to make up your 10 points. A point may be a big bunch of kale, a few pounds of tomatoes, a bunch of radishes, or a head of Chinese cabbage. This way, you can take what you want and what you are most likely to eat. Want to make a batch of your famous pickles this week? Use your points to get more cucumbers! Tired of kale? Get extra lettuce instead! You will have 9-15 items to choose from every week, as well as access to Pick-Your Own (PYO) crops like cherry tomatoes, beans, peas, herbs, and flowers. See below for a full list of what we will be growing! Occasionally we will limit the amount of a certain item based on availability. We will also offer a Farmer’s Choice selection each week if you don't want to decide on your own and want the option of a more traditional CSA share. In addition to our veggie shares and PYO crops, we hope to offer some add-ons like fruit and meat shares from local, sustainable businesses. We also plan to stock our farm store with value-added products like pickles, ferments, cheese, soap, flower bouquets, dried herbs, and salves, made by us from farm-produce, or by local purveyors. If you cannot pick up your share during distribution, we will package the Farmer’s Choice share for you to pick up at your convenience in our cooler. ​Members picking up at the cafe will receive the “Farmer’s Choice” share and are welcome to visit the farm for you-pick flowers and additional veggies during daylight hours M-Sat. Delivery to your Door is available for all shares for an added fee. ​We try to keep our shares as affordable as possible. Our share price is based on the real amount we need to generate in order to cover our operating expenses and basic cost of living. Our profit is getting to do what we love in community. In signing up for a membership, you are purchasing high-quality produce, herbs, and flowers, as well as sponsoring an alternative, sustainable, and environmentally friendly food system for farmers and consumers alike. All shares include Pick Your Own flowers as well as snow and snap peas, beans, and cherry tomatoes. The basic cost of a share is $700 for 23 weeks, or about $30/week. Pre-pay in full for $700! Paying the full amount all at once is extra helpful to us as we make major purchases to start the season off. Pay in two installments of $350, making both installments before the season begins on June, 1st. We will offer a limited amount of work-share options for people who want to spend some time getting their hands dirty in the field and save some money on their veggies. These shares cost $575 and ten hours of pre-scheduled work on the farm over the course of the 23 weeks. You will work with a farmer on a task appropriate to your skill and comfort level. Expect to be challenged and learn something new, whether that is how to prune greenhouse tomatoes, or how to get lost in the mediative act of hand weeding. Pay for the work share in full at $575 or in two installments of $287.50 made before June 1st. Share a Share: Don’t eat that many veggies? Only want to pick up every other week? Find a friend or family member to split your share with. If you would like us to help you find someone, let us know. Pay for your half of Share a Share in full at $350 or in two installments of $175 made before June 1st. In our first year operating Great Song Farm, we will work on building our capacity to offer subsidized shares. If you are passionate about participating, but cost is going to be a limiting factor for you, or an extended payment plan would make our CSA feasible, please contact us. Pay by cash, check, or card. We accept SNAP benefits. Credit card payments will incur a $10 transaction fee for full-season payments and $5 for half payments.